Over the past 50 years Australians have developed a love affair with COLORBOND® steel. As a nation, we’ve embraced the look, marveled at the performance and come up with many innovative ways to use it in our public buildings, our homes and gardens. Here’s why KITELEYS recommends COLORBOND® steel roofing and the whole range of COLORBOND® steel products. COLORBOND® steel products are manufactured in Australia, vigorously tested for Australian conditions, and backed by BlueScope Steel Ltd – one of Australia’s largest manufacturers. BlueScope Steel and Lysaght offer extensive product warranties for your peace of mind. To find out more about the warranties available for your project please see our warranties page here or contact us on 1300 484 693. Australia’s weather map is wide and varied. This means homes and buildings around the country are subject to a wide variety of harsh conditions, including heat and cold, dust, rain, wind, hail and even snow. Because of this, Bluescope tests COLORBOND® steel products in a laboratory setting and, more importantly, in real applications across many different environments. COLORBOND® steel products undergo outdoor exposure, corrosion, durability and application testing – a rigorous process that exceeds the Australian testing standards. You can be confident of COLORBOND® steels’ durability and performance across a wide range of projects and applications. COLORBOND® steel has been part of the Australian landscape for 50 years. In this time, the products have been finessed, the technology advanced and the colour range expanded – inspired by our wide and varied landscape. Australians have a passion for COLORBOND® steel. We use it on roofs and walls, gutters and fascia, in fences, garage doors, sheds, garden beds, carports as well as a whole range of custom creations like letter boxes, cubby houses and even Christmas trees! You could say it’s part of our National identity, as is beautifully shown in this 50th anniversary advertisement. Genuine COLORBOND® steel is far more than just ‘paint on steel’ – it offers five layers of protection to your home or building. COLORBOND® steel manufactured in Australia to Australian Standards (AS1397 and AS/NZS 2728) and rigorously tested in a range of harsh conditions. The base steel is then coated in BlueScope’s industry leading metallic coating incorporating Activate® technology*, for enhanced corrosion resistance. A topcoat of specially developed, exterior grade paint is baked on to provide resistance to chipping, flaking and blistering and maintain the great looking finish. *Activate® technology is not available for COLORBOND® Stainless steel, COLORBOND® Permagard® steel, and COLORBOND® steel products with a galvanised steel substrate. COLORBOND® steel is a great choice for your home, your wallet and our planet. Did you know five of the colours in the COLORBOND® steel range qualify as ‘solar reflective roofing’ under the Green Star Communities tool? The good news here is that light coloured roofing improves a home’s energy efficiency which means you save on your power bills. Every colour (except Night Sky®) in the standard COLORBOND® steel range also features Thermatech® solar reflectance technology. As the name suggests, Thermatech® technology reflects more of the sun’s heat, keeping you cooler and reducing heat stress on your roof. COLORBOND® steel is durable and resilient, and its long life helps conserve resources and energy. All COLORBOND® steel contains recycled content and is 100% recyclable and, in some cases, can be reused without reprocessing. COLORBOND® steel is lightweight, which can mean lower transport costs. COLORBOND® steel can help protect your home in stormy weather. Many areas of Australia are vulnerable to the threat of bushfire. 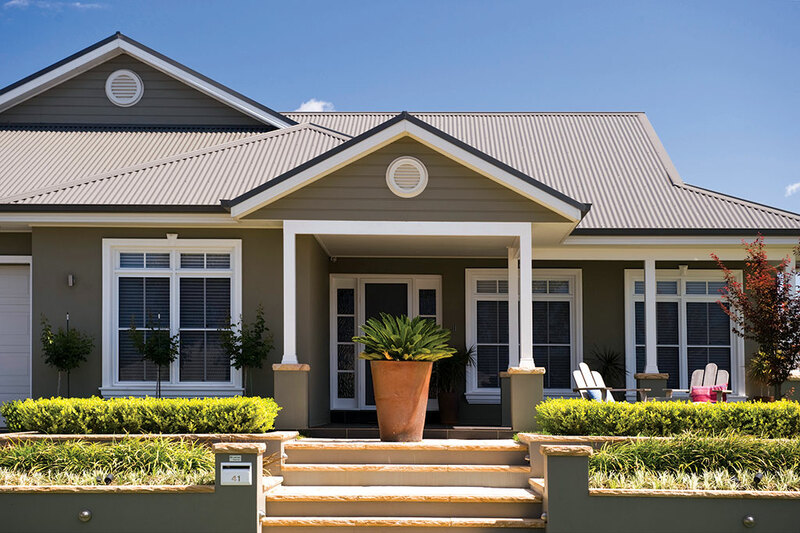 Research shows COLORBOND® steel may help protect your property. COLORBOND® steel roofing, walling, gutters and downpipes are also compliant for use in bushfire zones, including the most extreme, BAL-FZ (Bushfire Attack Level – Flame Zone) specified in AS3959-2009. In BAL-FZ “there is an extremely high risk of ember attack and burning debris ignited by windborne embers, and a likelihood of exposure to an extreme level of radiant heat and direct exposure to flames from the fire front.” (Ref. Australian Standard 3959-2009). For more information take a look at this fact sheet (download “Fact Sheet: COLORBOND® steel clad roofing system construction, details for bushfire-prone AS3959-2009 BAL-FZ sites“). One of the great things about COLORBOND® steel is that it’s easy to maintain and clean. In fact, roofing and other areas regularly washed by rainfall don’t need any extra care. It’s also easy to prolong the life, and keep the look, of COLORBOND® steel that’s protected from the rain – like wall cladding under eaves, the top of your garage door or the underside of eave gutters. In most cases you should hose the surface down with clean, fresh water every six months. If you live by the coast or where there are high levels of industrial fallout, hose down more frequently. Make sure there’s no build-up of debris, such as soil or mulch against COLORBOND® steel products. You just won’t get all the benefits of COLORBOND® steel from other brands. To make sure you’re getting the genuine article look out for the COLORBOND® steel branding on the product, or its packaging. Roofing and walling – check for the ink branding on the reverse side of the sheet. Fencing – look for laser branding on either side of each panel; it appears at least three times in each 2.4 m section. Guttering – look on the inside for ink branding, and, in some Australian states, on the protective wrapping too. No matter what the project, and whether you’re a homeowner, a builder or a developer, KITELEYS’ expert tradespeople have the knowledge and experience to help. You can be confident in our advice on choosing the right materials for your project. Call us today on 1300 484 693 or email us here. Whether you are after a supply only order or a full supply and installation service, let our friendly team assist you. Keep up to date with the latest product innovations and promotions. © 2018 KITELEYS. All Rights Reserved.